This lemonade sounds so refreshing, Jessica! I love that you can control the amount of sugar and ingredients in here. Sounds so refreshing! I love lemonade in the summer – such a cool and refreshing drink. Jealous that you are in the Mediterranean! I would love to visit there one day! Oh man, fresh lemonade is one of the best things about summer! We have a big family picnic planned for this weekend, and I totally need to make a batch of this lemonade. Looks delicious, Jess! P.S. I hope you are enjoying your well-earned vacation…take lots of pictures!! Summer is all about making fresh lemonade. The best way to stay hydrated. Lemonade is so fun to make- and better than the processed storebought! Such a refreshing post – both the lemonade and the pictures! And I do love these cocktail straws – so cute:) Have a nice vacation. I hope you’ll back inspired with the Mediterranean cuisine too. This is great – I’ve been looking for a homemade lemonade recipe. Can’t wait to try it! I am so envious knowing you are on holiday. I wish I were there too! Simple but for sure refreshing…Enjoy!!! Enjoy your time at the Mediterranean!! Perfect way to cool down in summer! thanks for refreshing share, Jess! loving it! Super easy and refreshing Lemonade.. Perfect Summer drink!! Thanks Nadia! 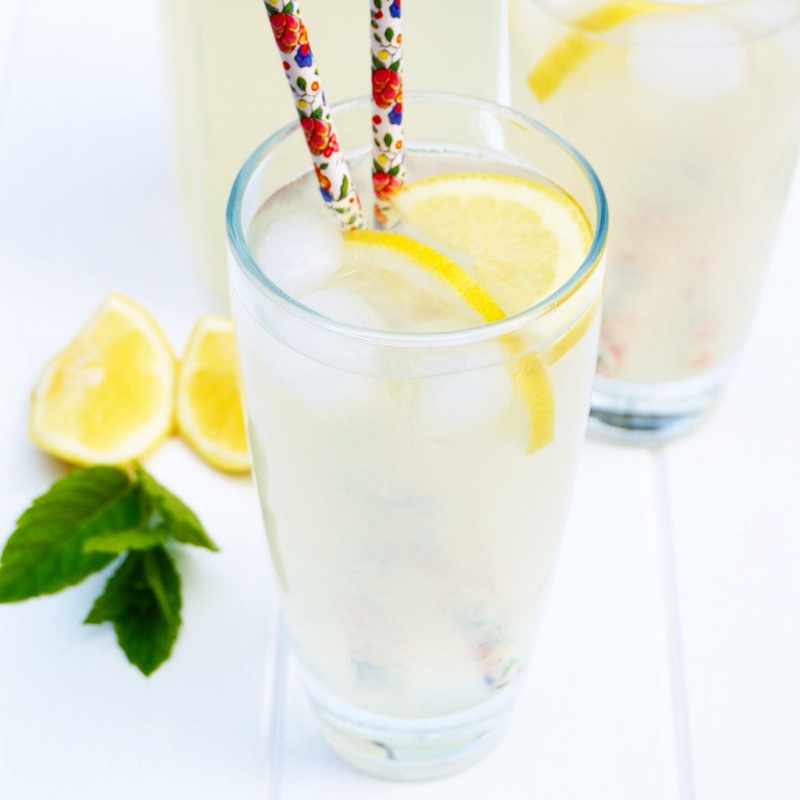 Love the idea of serving sparkling water with lemon and no extra added sugar – definitely going to try that healthier version soon! Thanks for sharing your lovely idea! 😀 Fresh mint is always a delicious addition in drinks! This lemonade looks so quick and easy though, especially since you don’t have to boil the water and wait. I’ve been wanting to make my own lemonade again recently, and this is the most quick and easiest recipe I’ve seen. I’d like to use still water and add citric acid so it seems fizzy without carbonation but wow, no-one seems to sell food-grade citric acid on the high street. Total bummer! Have SO MUCH FUN!! And enjoy the break!! 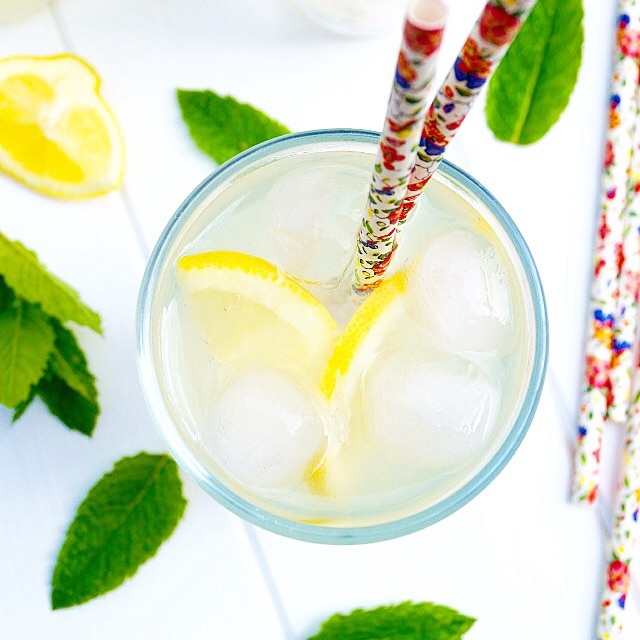 This lemonade looks so fabulously refreshing and SIMPLE – just what my summer needs. Wow, I’m just a little jealous of your Mediterranean holiday 😉 Hope you have a wonderful trip and drink lots of lemonade! Looks delicious! Thanks so much Izzy – the straws are so cute, right?! This lemonade was really delicious and perfect on a warm day! Yey! This post is so timely since I’ve got a few lemons on the fridge. This lemonade looks so refreshing! I hope you are having a wonderful holiday! This sounds 100% perfect for a hot summer day! I think I have a bag of lemons on the counter- I should definitely make some soon. Hope you’re having a great vacation! Homemade lemonade is the best! Can’t wait to enjoy this on our hot summer days! I need a glass of this right now! I also need those straws! I hope you are having an enjoyable vacation and eating some wonderful food. I’m Jealous! I’ll sit back sipping lemonade while I wait for posts about your time in the Mediterranean. Thanks Cali – we had a fantastic holiday and ate lots of delicious food in Cyprus! 😀 Article about our trip is coming next week to the blog! Oh my gawsh! You are in the Mediterranean?!? Kill me with jealousy why don’t you! I’d say I hope you are having a good time.. but im positive you are! So instead I will say- take LOTS of pictures!! Can’t wait to see them! Lemonade is quintessential summertime and yours looks delish! Super easy, extra refreshing and seriously scrumptious! I’ll take mine the adult way… Because, well, why not?! 🙂 ♡Cheers and enjoy your vacay!!! Glad you love the lemonade – it really is the best summer drink!